Acting on promises he made during the 2016 election campaign, President Donald Trump is taking steps to overturn policies from the presidency of Barack Obama. Last Tuesday, the president signed an executive order that takes aim at environmental rules and other measures he says harm economic growth. Trump ordered a rewriting of rules aimed at cutting greenhouse gas emissions from power stations. Many scientists agree that gases such as carbon dioxide are partly to blame for rising temperatures in Earth’s atmosphere. But Trump says cutting the rules on power plant emissions will create jobs for Americans. "Perhaps no single regulation threatens our miners, energy workers and companies more than this crushing attack on American industry." The Obama administration rules were meant to cut carbon dioxide from power plants by a third from 2005 levels by 2030. Trump’s action also lifts rules on coal, oil and gas production. And it reduces the effect of climate change in other federal rules. Democratic Party lawmakers reaction to the executive order came quickly. Officials will have to create new rules to replace the ones being overturned. Environmental groups are expecting to take the Trump administration to court. But some observers think that because of legal battles and the regulation process, Trump’s order will do little to change Obama’s Clean Power Plan. 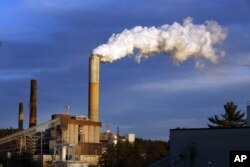 That measure requires cuts in carbon emissions from power plants. Tomas Carbonell is policy chief with the Environmental Defense Fund, an environmental group. He says the federal Environmental Protection Agency (EPA) has the legal duty to reduce harmful gases. "The Supreme Court has already held on three separate occasions that EPA has the authority and responsibility under the Clean Air Act to address the threat of climate change." FILE - Gas is pumped into vehicles at a BP gas station in Hoboken, N.J., June 30, 2016. 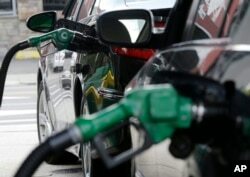 Federal regulators will review strict vehicle fuel efficiency standards finalized days before President Donald Trump took office. The executive order follows another one that calls for changes to the Obama administration’s rules for vehicle fuel efficiency. Those rules were put in place just days before Trump became president. Trump calls the measures "industry-killing regulations." But environmental and doctors’ groups say they are cleaning the air and will help Americans spend less on fuel. The president’s proposed budget targets climate change programs across the federal government. Mick Mulvaney is the Trump administration’s budget director. "Regarding the question as to climate change, I think the president was fairly straightforward. We're not spending money on that anymore. We consider that to be a waste of your money." Candidate Trump once called climate change a hoax. However, a White House official told reporters this week that the president does believe in man-made climate change. Tuesday’s executive order does not talk about the Paris climate change agreement. Trump campaigned on withdrawing from the agreement. Steve Baragona and Peter Heinlein reported on this story for VOA News. Anne Ball adapted the story for Learning English. George Grow was the editor. We want to hear from you. Write to us in the Comments Section, and find us on our Facebook page.